Description: For those Cannabis Lovers interested in Yoga Meetups. Join this group, coordinate inside for Meetups! 0 Comments | ZenMasterKush and 6 others react this. times and places to practice yoga. The origins of yoga have been speculated to date back to pre-Vedic Indian traditions, it is mentioned in the Rigveda,[note 1]but most likely developed around the sixth and fifth centuries BCE, in ancient India's ascetic and śramaṇa movements. [note 2] The chronology of earliest texts describing yoga-practices is unclear, varyingly credited to Hindu Upanishads. The Yoga Sutras of Patanjali date from the first half of the 1st millennium CE, but only gained prominence in the West in the 20th century. Hatha yoga texts emerged around the 11th century with origins in tantra. Ashtanga yoga incorporates epistemology, metaphysics, ethical practices, systematic exercises and self-development techniques for body, mind and spirit. Its epistemology (pramanas) is same as the Samkhya school. Both accept three reliable means to knowledge – perception (pratyākṣa, direct sensory observations), inference (anumāna) and testimony of trustworthy experts (sabda, agama). Both these orthodox schools are also strongly dualistic. 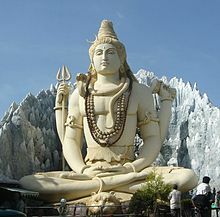 Unlike the Sāṃkhya school of Hinduism, which pursues a non-theistic/atheistic rationalist approach, the Yoga school of Hinduism accepts the concept of a "personal, yet essentially inactive, deity" or "personal god".Along with its epistemology and metaphysical foundations, the Yoga school of Hindu philosophy incorporates ethical precepts (yamas and niyamas) and an introspective way of life focused on perfecting one's self physically, mentally and spiritually, with the ultimate goal being kaivalya (liberated, unified, content state of existence). Many scholars also include the preceding Goraksha Samhita authored by Gorakshanath of the 11th century in the above list.Gorakshanath is widely considered to have been responsible for popularizing hatha yoga as we know it today.